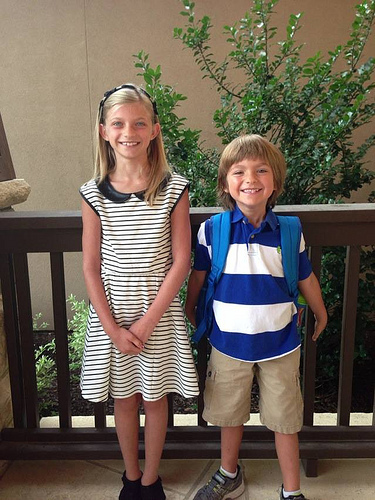 Here are the hoodlums cherubs on their first day of school — Kindergarten and third grade to be exact. I know, they don’t look unhappy, but believe me — there were some serious back-to-school blues going on around here this week. A random sampling: We have to go to bed without watching a movie? Are those BOOKS you’re trying to read us? When will we get to go swimming? Can you pick us up for a quick swim over lunch? No you spoiled brats sweet angels, I will not pick you up for a “swim” over lunch. But I did break down and bake our favorite blueberry muffins for a first-day-of-school breakfast. Everyone should wake up to these on important day… warm, sweet blueberry goodness with a crunchy cinnamon streusel on top. *Adapted from allrecipes.com, I swap out the white sugar in the streusel for brown. It doesn't look as pretty, but that carmelicious taste is worth it!